“Progeny” is a wholly pointless episode. Everything the team tries to do, like traveling to 2147 to kidnapping teenaged Per Degaton (Cory Gruter-Andrew) before his rise to power that decimates the world thanks to Vandal Savage’s influence, ends up having the exact opposite effect. Instead of stopping Savage or even slowing him down, their machinations speed up his tyranny. He ends up releasing the devastating virus in a matter of days rather than five years later, like in the original timeline, by the end of the episode. We’re already on episode 10 of a 16-episode season and I’ve lost count on how many filler episodes we’ve had. The show has greatly improved in recent weeks and the cast chemistry is stellar. But part of the problem is that Savage isn’t a compelling villain. The other problem is there has been very little happening that moves any of the plot forward in terms of taking him down. It’s all capturing MacGuffins that are vaguely linked to him or coming at him from odd angles. Coming into this episode I’ve been thinking a lot about the state of superhero adaptations, particularly on the CW. Much of this is thanks to Arrow continuing its tradition of being a Green Arrow show in name only and completely squandering Black Canary. It’s also a bit ridiculous Sara won’t learn about her sister for a few episodes, meaning we’ll have to be reminded of how terrible Laurel’s final moments were again. Laurel Lance’s death and the mistreatment of the character as a whole points to a problem I see nearly across the board in the CW’s television adaptations of these iconic characters. (Yes, even The Flash, a show I love, has a woman problem). But I’m mostly referring to the discomfort these shows have with the comic’s canon. They want to deal with iconic characters but often discard why they’re beloved in the first place. Rip Hunter and Vandal Savage, lynch pins for this season, are somehow incredibly boring. Kendra has barely any of the wit and badassery of Hawkgirl. Of course there are improvements, mostly in the form of Leonard Snart–Captain Cold and Mick Rory–Heat Wave (who are very different than their comic counterparts), whose side plot provides us with the few compelling moments the episode has. Don’t get me wrong: Legends of Tomorrow has proven itself to be an incredibly fun show. But can the great action scenes, like this week’s climax, and the cast chemistry provide enough joy to cover up the fact that the main plot involving Savage doesn’t work? I’m not so sure. “Progeny” involves the team traveling to an incredibly boring version of the future. It’s 2147 and governments have given way to overruling corporations. Beyond the Kasnia Conglomerate, the world is supposedly devolving into chaos. Which is hard to believe given we don’t get to see any of that and it doesn’t feel all that urgent. Apparently, this is human society at its zenith. But apparently the zenith of human culture looks like pretty much any boring, budget version of the future. Everything is in shades of gray. There’s an automated police force whose technology is based on the same design of Ray’s Atom suit, which gives him an intense internal crisis when he starts to believe he founded the company and that the scientist, Dr. Rachel Turner, (played by sci-fi staple Jewel Staite) who shows him around is his great-great-great granddaughter. The team targets the teenaged Per Degaton whose father currently rules Kasnia Conglomerate. But within a few years Per Degaton forcefully takes over, releases a virus that decimates the world, and is ultimately a pawn for Savage, who kills him once he outlives his usefulness. More than once the kid is referred to as Hitler (or specifically “Baby Hitler” by Leonard) given the fact that mass murder is his defining trait in the future. Killing Per Degaton would be a major blow to Savage’s plans and would at least provide some interesting texture to these heroes. It also means there would finally be some forward movement in the show. They’ve really done very little to disrupt his plans. Despite Rip Hunter taking Per Degaton to a secluded location after they kidnap the teenager, he of course can’t go through with killing him. Which assuages the rest of the group who feel killing the kid is incredibly immoral despite the fact that he’s destined to be a mass-murdering tyrant who can easily be compared to Hitler. At that point, isn’t killing him the smarter thing to do? Except for Leonard, who in this episode and nearly every other, proves to be the most intelligent, forward-thinking of the bunch. Sure, killing a kid who at that point hadn’t done anything isn’t heroic, to quote Mick, but the alternative proves to be a lot of worse. But let’s talk about destiny, which is a running theme throughout the show. Legends of Tomorrow has been very contradictory with how it deals with destiny, and all you have to look to for that is Kendra. At this point, Kendra and Ray’s cute relationship has hit a snag. She’s having visions of her past life in the 1920s with Carter Hall and their young son, Aldus. But she’s not only remembering, she’s also regaining the feelings she had for Carter. To the point that she tells Ray she feels she’s cheating on Carter with Ray. Yes, that’s right, Kendra feels like she’s cheating on a dead dude with her actual boyfriend. The show has made progress with Kendra by deciding to have her choose free will over destiny. Falling in love with the same dude again and again over centuries isn’t romantic, especially when he’s a dud like Carter. Kendra ultimately tells Ray not to give up on the relationship and that he’s her future, while Carter is her past. This is the first time we’ve seen Carter extensively since his death early in the season. This new plot thread seems to be hinting at Carter coming back into the picture, which will only mess up what little progress has been made with Kendra’s characterization. While Kendra deals with her past, Ray is dealing what he thinks is his future. But he ends up being very, very wrong. It’s his brother, Sidney, that is the bust in the headquarters and is Dr. Turner’s great-great-great-grandparent. Sidney must have started working for Felicity and used the Atom technology for his own gains. Ray doesn’t have any kid running around 2016 he doesn’t know about. Thankfully, the Mick and Leonard drama at least feels satisfying. After avoiding Mick as much as possible, Leonard finally decides to face him and proposes a fight to the death. Mick gets the upper hand, yet he can’t kill his old partner. Will we finally see these two on the road to friendship again? Mick gives them some important information that charts their next course. The Time Masters have it out for Mick now that he couldn’t deliver the team. So, they’ve hired a bunch of ruthless mercenaries to kill all of them. Okay. Sure. Whatever. Does this mean we won’t get much of Savage in the episode? I may not be a big fan of this incarnation of the character, but he is the Big Bad of this season. It feels like every other episode he disappears. 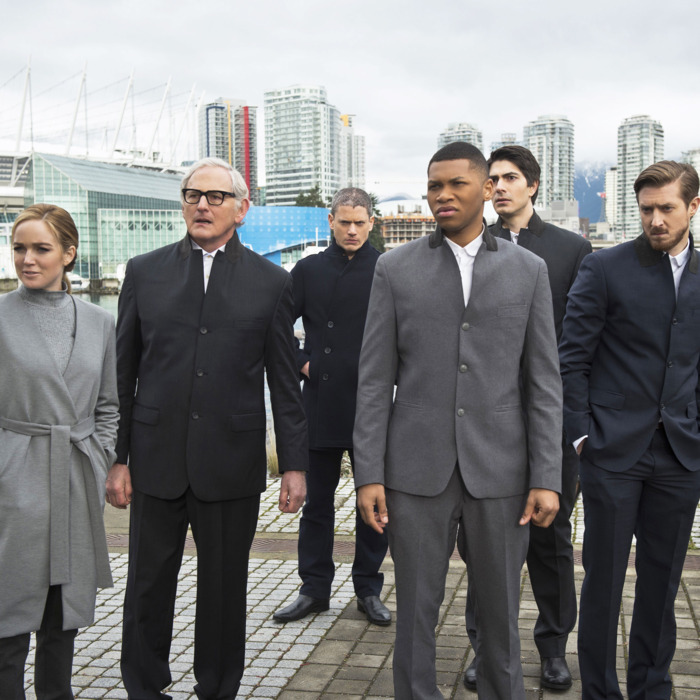 But since we’re beyond halfway through with this season, Legends of Tomorrow needs to start prioritizing its main villain and making some progress with that story line. Otherwise, let’s just make it the Leonard and Mick Show. At least that would be entertaining and have emotional stakes.